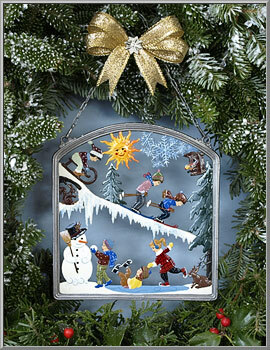 Playful children create a scene of joyful Wintertime outdoor fun! 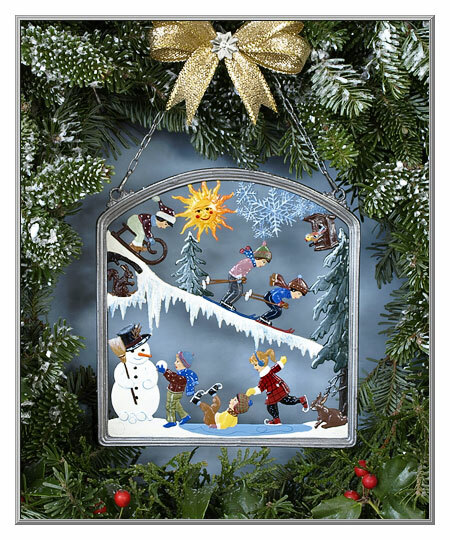 This collectible art pewter treat can be displayed on a wall, or hang it in a window. Crafted in a small, quaint village in Bavaria using the very same techniques that have been employed by the same family for more than 300 years, each art pewter decoration is hand-cast, one at a time. Expertly painted by skilled artisans, the colors will vary at the painter's whim, so that no two are the same. Presentation gift boxed, it's made in Germany. Sold as one pewter decoration.